Incorporating the latest design and manufacturing technologies, the Oxford Journey is a mobile, folding, battery operated stand up hoist which brings a person from sitting to a supported standing position. The hoist has attachments for sling loops, with dual positions, depending on height of person to be hoisted. Constructed from epoxy powder coated steel tube, it features a single mast which supports a single, straight boom. The boom has a "C" shaped end with two attachment points for sling loops on each side, plus padded slip resistant hand grips for the user. The 100mm castors swivel at the front with step on lock castors on the rear. The rectangular shaped foot plate has a black, rubber, slip resistant upper surface, with a raised edge on both sides. 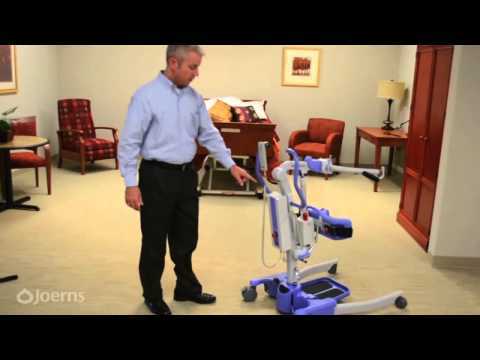 The foot plate is removable for cleaning or gait training. The knee pad is vinyl upholstered and has lateral supports to each side and is height adjustable. It has a retractable safety belt for extra support. Suitable for domestic and healthcare facility use with a range of compatible slings.